Peony perfection! Everyone loves the lush, cloud-like appearance of fresh cut peonies. The romantic, feminine bloom is a popular summer wedding flower. In fact, many brides select their June or July wedding dates based on the cut peony flower season! This simple bouquet is a beautiful pick for any pink-lover. Also, a luxurious wedding centerpiece! 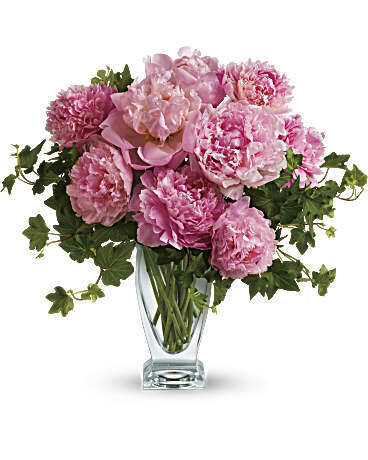 Freshly cut pink peonies and classic green ivy are gathered elegantly into Teleflora''s Couture glass vase.